This document is copyright (c)2009-2011 by Robert M. Keller, all rights reserved. The Impro-Visor logo is a registered trademark and copyright 2010-2011 by Robert M. Keller..
Impro-Visor itself is free, open-source, software, licensed under GNU GPL v2 and copyright (c)2006-2011 Robert M. Keller and Harvey Mudd College. Impro-Visor was designed and developed by Bob Keller, together with Martin Hunt, Stephen Jones, David Morrison, Belinda Thom, David Wolin, and Steve Gomez (Dartmouth College), Jim Herold (Cal Poly Pomona), Brandy McMenamy (Carlton College), Sayuri Seojima, Emma Carlson, Stephen Lee, Jon Gillick (Wesleyan University), Kevin Tang (Cornell University), John Goodman (Open University in the U.K.). This project was supported by a Mellon Foundation Faculty Enhancement grant to Professors Keller and Thom, and by the National Science Foundation REU Program under grant Award No. 0451293 to Harvey Mudd College, and by a grant from the Baker Foundation. The group moderator is also the project director, and author of this document, and I will try to help you. 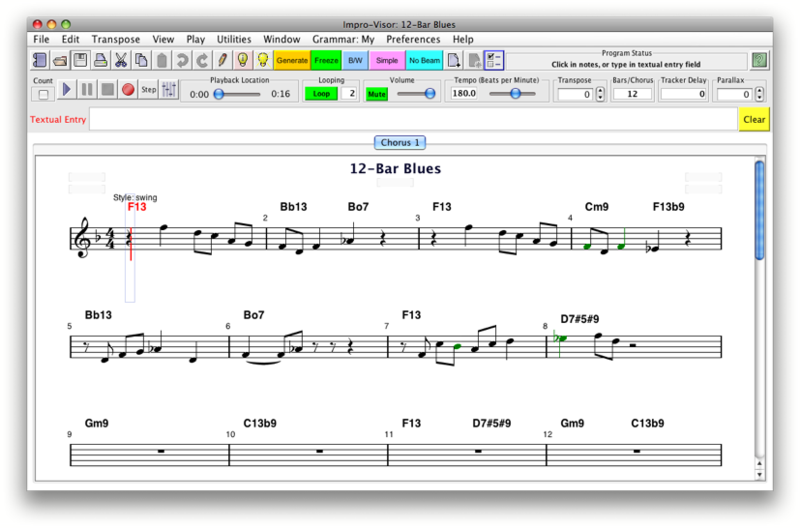 Impro-Visor is a music notation tool designed to help improvising musicians study chord progressions ("changes") and construct monophonic solos over them. 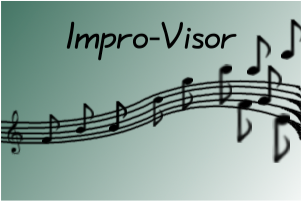 Impro-Visor has a number of additional features, such as auto-accompaniment based on chord progressions. Some features are in various stages of research and development. As such, Impro-Visor is both a usable educational product and an on-going research project. You must have already installed Java version 1.5 or later (1.6 or later preferred). There is no way that Impro-Visor will run without Java. For MacOS X, this means that you have operating system version 10.5.5 or later. Generally, it is best to select the most recent release. Click the greenbutton, or View all files for more selections. a. Double-click the installer to install. b. The installer will take you through the necessary steps. c. Once you have installed, Impro-Visor is launched by the Dog icon. d. Do not try launching by running the installer again. � There is a generic version packaged as a .zip file. � This version does not include an installer or launcher. � Java 1.5 or later is still required. To launch the program, double-click the Impro-Visor dog icon, or the .jar file if you are using the no-installer version. Once Impro-Visor has been launched, the splash screen shown indicates that Impro-Visor is loading the vocabulary and style information. The initial main screen shows a blank leadsheet. A leadsheet consists of a single melody line with chord symbols above. There is an option to use bass clef, or a grand staff with two clefs. The result should appear as shown below. The chord symbols are F13, Bb13, Bo7, etc. The notes are the melody line. These leadsheets are not distributed on SourceForge and are not governed by the GNU GPL. to play from the start. Click the box marked Count to have a count-in before playing the leadsheet. Count-in applies only only to playing from the start, not for playing individual sections. Count-in is currently two measures long. For 4/4 time, the count is jazz style: 1-3-1-2-3-4. For other times signatures, each beat is hit, with the 1 being differentiated by a different tone. Control the tempo by using the slider provided, or simply type in the number of beats per minute. The location slider indicates the position of the playback relative to the entire leadsheet, including all choruses. It can be controlled manually to move around within the leadsheet. 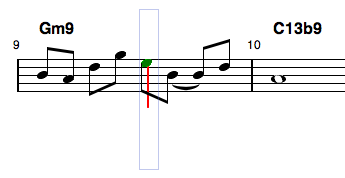 When a selection is played, there is a green vertical tracking line that moves along from note to note. On some systems, the line starts ahead of the sound. This is a function of the MIDI playback, which is not under the direct control of Impro-Visor. To delay the line from the sound, enter the number of seconds, in decimal notation in this field. Impro-Visor emits sound only from a MIDI player or device. Check that your volume is turned up and not on mute. 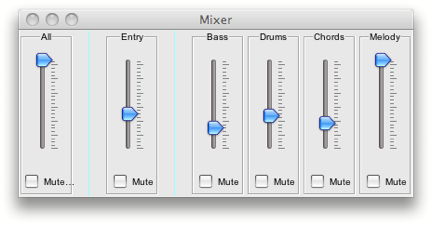 Check your Audio/MID control panel. If you want the sound from the built-in Java synth, please disconnect any external MIDI devices. 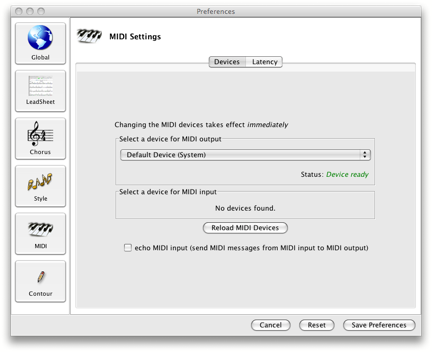 If you want the sound from an external MIDI device connected, you will need to select it from preferences. The transpose field transposes the playback up or down the indicated number of semitones from what is written in the notation. The use envisioned is for transposing instruments. For example, for a Bb instrument (trumpet or tenor sax), use -2 and enter notes as if you were writing for that instrument. For an Eb instrument, use +3. You need to adjust the key signature manually. 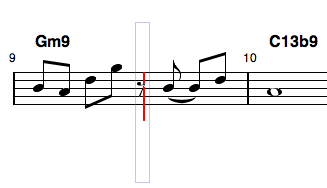 Transpose does not change the notation, just the playback. We call the vertical lines that you see above slots. They correspond to temporal sub-divisions in the music. Slots are places where notes can start. These notes can be clicked in using the mouse. By default, there are two slots per beat (as shown by the bracket 2), so the duration between one slot and the next is that of an eighth note. There are actually 120 slots in one beat, but only a few of them typically show at a given time, to avoid clutter and confusion. To enter triplets, sixteenth notes, etc., the slot spacing needs to be changed. By pressing a numeric key, one of 1, 2, 3, 4, 5, 6, 8 the slot spacing changes to that many slots showing per beat. Thus for eighth-note triplets, press 3 and enter the notes or rests. For sixteenth notes, press 4 and enter the notes as shown. You can always use more slots than the necessary number, just by skipping over slots on which notes do not start. 1,2,3,4,5,6, and 8 slot spacing settings. The brackets on top are the triplet brackets. The brackets below show the slot spacing. By selection, I mean a region on the staff of one or more slots. Various user actions pertain to the current selection. To extend the selection to include more slots, shift-click the mouse at another slot. That is, click the mouse while holding down the shift key. The slots in the current selection should be highlighted. 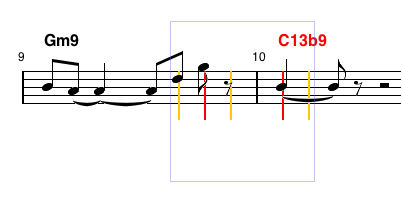 The figure below shows the result of shift-clicking at the end of the second measure. To play only the selection, press the return key. As before, to stop playing, press key k or the stop button. To play from the start of the selection to the end of the chorus, press shift-return. 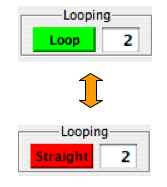 To loop the current selection or chorus in a loop, press the green Loop button to have the playback repeated the desired number of times. Looping begins the next time you play. If you set the times to 0, it will loop until stopped (with the stop button or k key). Press the Straight button to not loop any further the next time playing occurs. You should hear your note in the context of the chord being played along with it. If you do not want to hear the note, you can silence everything by toggling the Mute button. If you did not want a note as long as Impro-Visor gives use, this is easy to change. Impro-Visor is just trying to make it faster to enter notes, by not requiring you to enter a duration for each note separately. If at any point you do not like what you entered, just go back and click over it. Impro-Visor will never put more than one note in a slot. Moreover, as you click a different pitch in a slot, then duration of the note will remain the same. Pitches were modified, but durations remain the same. Impro-Visor renders eighthnotes-, sixteenth-notes, etc. with beams automatically. There is no user specification of beam usage or placement. 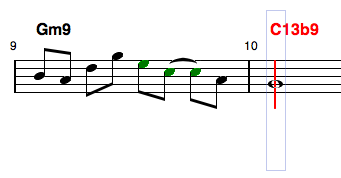 Currently dotted note combinations, such as dotted-eighth with sixteenth, are not beamed. Beams can be turned on and off by the button labeled No Beam. The parallax text field in the menu bar adds the indicated number of pixels in the vertical dimension to your click position when entering notes. This can be used to accommodate variations in monitors, monitor positions, and tastes. Use a negative number to subtract pixels. You may notice that notes are shown in various colors. These colors have tutorial significance, as explained below. If you do not want coloration, you can turn it off by pressing the button labeled B/W (for black and white), and toggle it back by pressing Color. The note is in the current chord. The note is not in the current chord, but is complementary and compatible with it. The note is not one of the above, but approaches a note in one of the above categories chromatically. This is a common device used in jazz. This note is not one of the above. If it is a short note, it might be acceptable as a passing tone or neighboring tone. If long, it might suggest reconsideration, as it will tend to make an aural statement. The user can easily experiment with changing to a different note, for example by using the e (up) and d (down) keys to transpose. 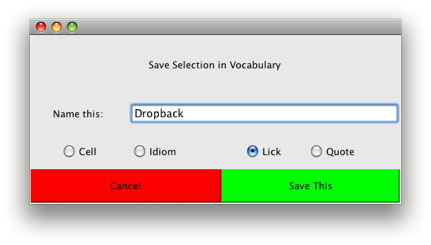 Impro-Visor note categorization comes from the vocabulary file. If you disagree with a categorization, it can be changed to suit by modifying the vocabulary. Notes entered by point and click are generally rectified to fit the harmony upon entry. For example, if the current chord is C7 and the b line on the staff is clicked, you will get an B-flat, corresponding to the chord, rather than a B-natural, regardless of how the key signature is set. Another way to make corrections is to use the undo feature. Pressing key z will undo the most recent action. Pressing key y will redo what was just undone. Arbitrarily-many steps can be undone or redone. To do serious editing with Impro-Visor, you will want to know how to select a slot without setting or changing a note. This is the most complex editing action in Impro-Visor, and it is different from other software, so please read carefully. Once you have mastered this move, many other actions will be easy. To select a single slot inside the current selection, simply shift-click the slot. For example, to click on the e note in the previous diagram, I hold the shift key and click there, then click again. 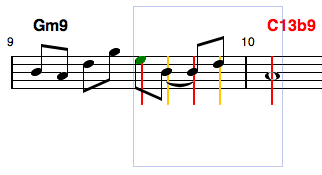 The first step extends the current selection, while the second reduces the selection to a single note. Step 1.: shift-click on e slot extends the existing selection to that slot. Step 2.: shift-click reduces the selection to a single slot. Had it been the case that there was no selection initially, only step 2 would have been necessary. To select everything, press control-a. To unselect everything, press the escape key. Too add a rest, you simply select a single slot, as above, then press the r key. Rests have characteristics similar to notes. They just have no pitch. Impro-Visor may merge adjacent rests together into a single long rest. Thus the value of the rest will be that of the note it replaces (or longer, if the note was followed by a rest). An alternate way to add a rest is to click on a slot while pressing both shift and control. The figure below shows a rest added where the e had been. Adding a rest using the r key. To lengthen a note, taking away the time from the note that follows, select the note, then press the x key. Lengthening a note, by taking time from the note that follows. Notes can be moved by dragging. Notes over which dragging occurs will be over-ridden. Select the notes to be moved, then drag left or right on any note in the selection. Notes can be transposed uniformly up or down by dragging. Notes can be transposed up or down by key strokes. Probably the most useful is harmonic transposition, in which notes are automatically aligned to conform to the current chord in effect. To transpose a note or group of notes up harmonically, use key w.
To transpose a note or group of notes down harmonically, use key s.
Notes before harmonic transposition up. Notes after harmonic transposition up. Notes after harmonic transposition down. A frequent use for harmonic transposition is to correct mis-entered notes. This is how I use it. This allows one to be inaccurate in pointing to a staff line and quickly make a correction to be in line with the chord. To transpose a note or group of notes up one semitone, use key e.
To transpose a note or group of notes down one semitone, use key d.
To transpose more than one semitone, use several presses in a row. To transpose a note or group of notes up one octave, use key t.
To transpose a note or group of notes down one octave, use key g.
Notes after uniform transposition up a semitone. � The Drawing feature allows a melody to be drawn on the screen. 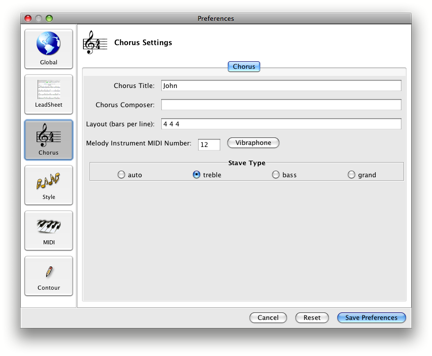 � It is automatically adjusted to conform to chords and scales. � Thus this is a feature that could be used by the musically unsophisticated to draw a melodic line with a particular shape. � Then drag the mouse over the part of the staff at which a melody is desired, moving up and down as you go. � The notes are determined by the slot spacing. 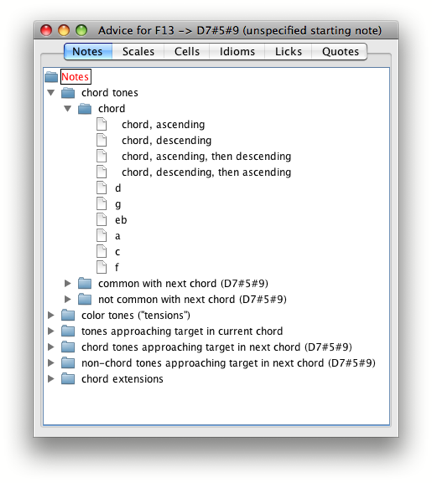 To toggle the enharmonic representation of notes in a selection (e.g. switch eb to d#), simply press the space bar. This only changes the visual representation of the notes, not the sound. To toggle chords enharmonically (e.g. Db7 to C#7), press the space bar while holding shift. To toggle for both notes and chords, press the space bar while holding control. Select the notes to be copied. Press the c key (for copy). Select the starting slot where you wish to paste the melody. Press the v key (standard abbreviation for pasting). Use the x key instead of c if you wish to cut the original selection. You may paste a copied selection any number of times. Use the z key to undo recent pastings. Once you have pasted, you may wish to transpose the result or modify it in some other way. You can also click in different pitches to the same rhythmic pattern, as I have already described. 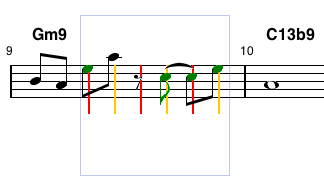 A selected melody can also be transferred to and from the textual entry area, which is not the same as the invisible clipboard used for cut and paste. Pressing enter in the textual area will paste the melody starting at whatever slot is currently selected. This is convenient for pasting the same melody more than one place. Any number of leadsheets may be open simultaneously. One can copy or cut from one leadsheet and paste to another. Focus on the last two bars of the tutorial leadsheet, where the chords are as shown below. Let's say that we want to change the chords in these two bars. Go to the Textual Entry field and type in the four chords. To indicate the bar lines, you may use either a comma or a vertical bar |. Comma is probably more convenient on most keyboards. To enter these chords in place of the existing ones, press enter. The same method is used to enter chords into a blank leadsheet. Simply select the starting slot. If you make a mistake, you can edit the contents of the Textual Entry field and use the cut and paste commands provided by the operating system. Then press enter again to over-ride the previously-entered chords. You can repeat as many times as you want, until it is as desired. Uneven spacing of chords is achieved by using single slash characters (separated from chords by blanks). The slash indicates sustainment of the previous chord, without restriking it. The rule is that all chord and slash symbols within a bar are counted up and the space divided evenly among them. For example, to produce the following distribution, where the A and B chords each get one beat, but the C chords gets two. To get the distribution above, enter the the text A B C /. The number of symbols, including / as a symbol, are tallied up and the bar is divided evenly among the chords. The / symbol does not restrike the chord. If you want a restrike, enter the actual chord name. This is much more convenient that the alternative of clicking each individual slot and entering the chord separately. As another example, in ¾ time, we might want the following, where A gets two beats and B one. To achieve the preceding, use A / B, since there are 3 beats to a bar. If you were to instead to use just A B, you wouldd get a duplet rhythm, which, while interesting, would be less common. Chords can be aligned to any slot, by using enough slashes to divide up the space. Currently 120 slots per beat are available, giving many gradations. Slashes can be combined with the NC (no-chord) symbol to achieve hits, breaks, and other effects. Slash chords (which specify a bass note after the slash) are indicated with a forward slash, such as D/E. Polychords (one chord stacked atop another) are indicated with a backward slash, such as D\Bb. An alternate way to transfer the chords to the leadsheet is to select the slot where the transfer is to begin after entering the chords, then press the (upper-case) B key. This is particularly convenient when the same sequence is to be transferred multiple times, as you do not have to return to the textual entry field and press return each time. To transfer chords in a selection back to the leadsheet, select the chords, then press the J key. The commands are analogous to those for melody, except the shift key is held. The (upper-case) C key copies the chords. The (upper-case) X key cuts the chords. The (upper-case) V key pastes the chords. The commands are analogous to those for melody, except the control key is held. The Control-c key copies melody and chords. The Control-x key cuts the melody and chords. The Control-v key pastes the melody and chords..
Melody is saved, and may be loaded, using a textual notation, in the same textual entry field as chords. In distinction to chords, which always begin with upper-case letters, melody notes begin with lower-case letters. � a pitch designator (a, b, c, d, e, f, g) possibly followed by an accidental (#, b) for sharp and flat. � an optional octave designator (+, ++, +++, -, --, ---) for octaves above or below the octave including middle C and above. The default is the octave just mentioned. 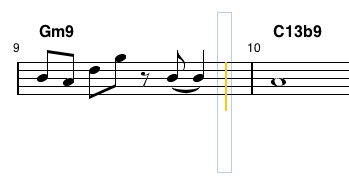 � an optional duration designator (4 for quarter note, 8 for eighth note, etc.) with + being used to add durations. The default is an eighth note. A good way to learn the textual notation is to read some existing melodies from the available leadsheets. To transfer selected melody from the leadsheet back to the textual entry field, press the j key. Both melody and chords can be entered at the same time. The two are separated into tracks using the upper- and lower-case distinction for chords vs. melody. � To transfer both selected chords and melody to the leadsheet from the textual entry, use Control-b, and to transfer back, use Control-j. Additional meta-data, such as the key signature, tempo, and so on, will be automatically saved when a leadsheet is saved from Impro-Visor. One can simply start with a fairly bare file of chords, read it into Impro-Visor, then write it back out and the meta-data will have been inserted. These items can be edited with any text editor, such as NotePad, Emacs, Word, etc. Impro-Visor itself also provides a minimal text editor that can be used to edit the file. If we open this editor from the Utilities menu, or using the shortcut Control-f, we can see the form in which Impro-Visor will save it. Changes made in this editor will not take effect until the Editor-to-Leadsheet button is pressed. These changes are not undoable, although you can always re-edit the content and press the Editor-to-Leadsheet button again. MIDI recording from an external MIDI instrument can be done by clicking the red circle button for continuous record. Disclaimer: This is one of the lesser developed features of the software, so do not expect it to work perfectly. In particular, there will be quantization errors for short notes. 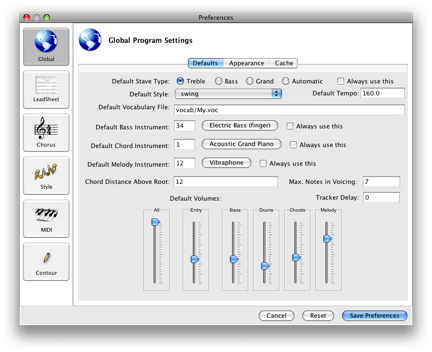 On the Macintosh, this feature requires a third-party MIDI program, such as Mandolane (http://www.mandolane.co.uk/). 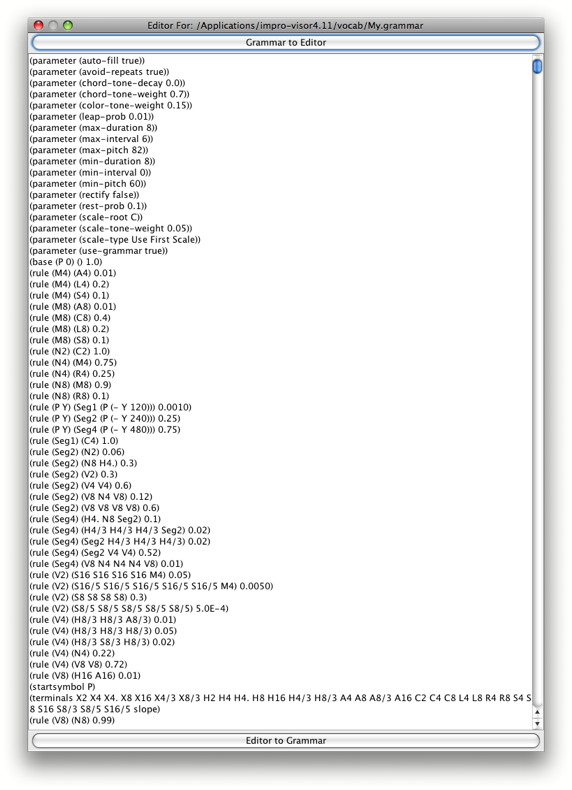 This is because Java sound is not well supported on Macs. Mandolane is not included with Impro-Visor because it is not our property. Notes can be entered one step at a time from a MIDI keyboard. The duration of the notes is determined by the grid line spacing. Press the Step button to begin. Each time a note is pressed on the keyboard, it is entered into the leadsheet and the cursor advanced to the next visible slot. or by the following action: Position the mouse in the key signature area. Then slowly drag up to subtract flats and add sharps, or down to do the opposite. 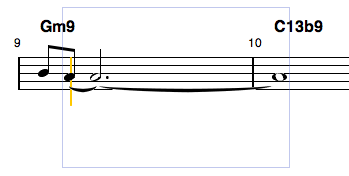 or by the following action: Position the mouse over the time signature. Then slowly drag up or down. The numerator (upper number) increases the fastest, then the denominator (lower number). The highest time available is 12/8 and the lowest is 1/1. Odd times, such as 11/4 are allowed. Any number of choruses can be played. The current model for Impro-Visor is that there is exactly one chorus structure, which can be played any number of choruses with different melodies. Although the chord sequence and length is the same for each chorus, the background will vary among choruses. Currently, new choruses must be added at the end of the existing choruses. The only way to rearrange choruses is to use a combination of cut and paste of the individual melodies. The highlighted tab corresponds to the current chorus. Each chorus may be given a separate title and composer. This information is entered on two fields on the right of the leadsheet. The title of the chorus will appear in the chorus tabs. The composer can be specified immediately below. The title appear in the tab. 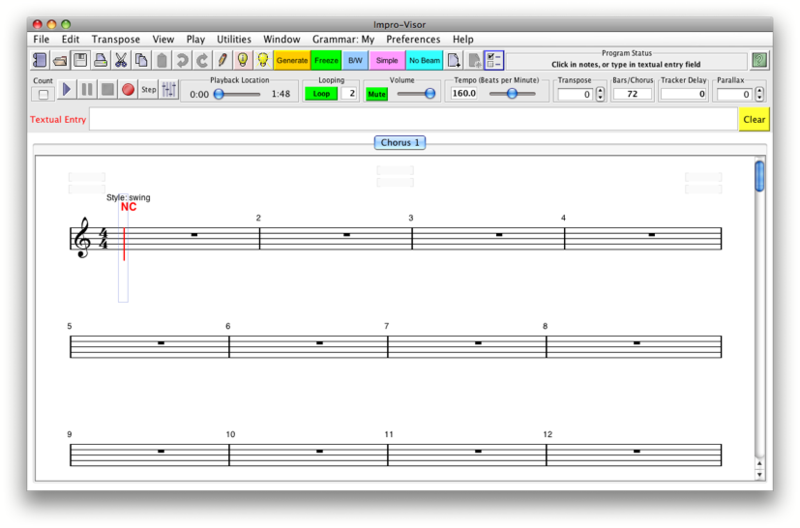 Impro-Visor opens a new leadsheet with a generous number of bars (e.g. 72). Often, this number should be shortened to accommodate the current song. 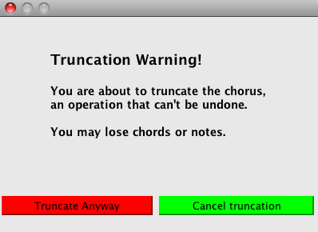 If shortening would truncate chord or melody information in any chorus, a warning dialog is issued first, so that content is not inadvertently lost. Again, all choruses have the same length, so that shortening one will shorten them all. Note: that changing the length of choruses is not undoable currently. Impro-Visor tries to lay out the measures based on the note and chord density. However, it is not perfect. Enter the desired number of measures. This approach is best for temporary fixes. A more permanent layout is obtained by freezing the layout. Pressing the Freeze button will keep the measure distribution as it is now. Thawing will allow Impro-Visor to auto-adjust the layout. Specified in this line are number of measure per line, line by line. If there are fewer numbers than there are lines, the last number is used for the remaining lines. For example, the specification above indicates 4 bars for the first line, 2 each for the next two lines, 4 for the next, then 2, then 4 for all remaining lines. Having any numbers in the Layout field is equivalent to having the layout frozen. From the File menu, select New Leadsheet, or use the shortcut control-N. This opens a new blank leadsheet, in addition to ones that may be open already. The blank one will look like the one at the beginning of this tutorial. You may cut and paste melody and chords from one to the other. You can close one or more of the open sheets. If you have unsaved modifications, it will offer to save them first. This uses the current window. It does not create a new one. If there are unsaved modifications, you will be given the chance to save them. If you want a fresh window, see the preceding section. Use Control-W to save the current leadsheet under a specified name. Files should be saved with extension .ls (leadsheet) for future loading. 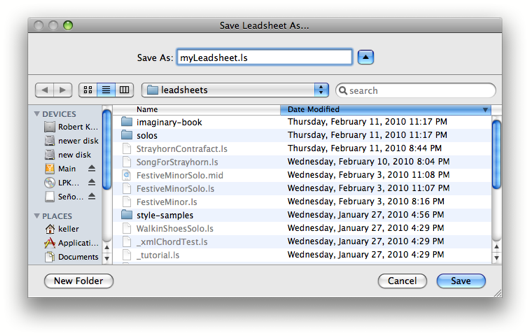 Use Control-S re-save a leadsheet under its current name. MusicXML files can be exported from the File menu. Currently each chorus must be exported separately. 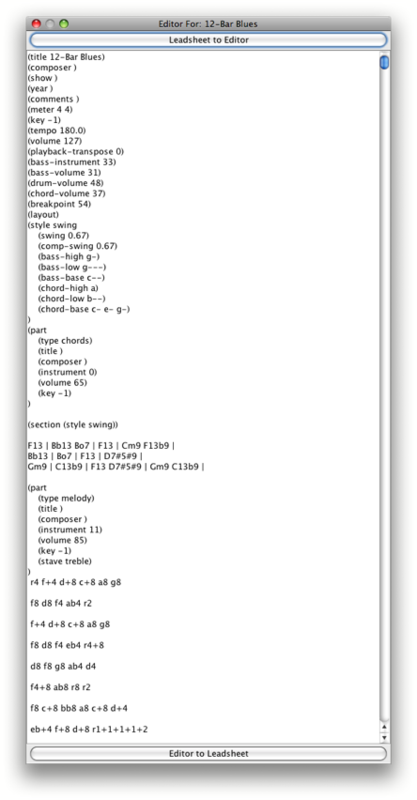 MusicXML can be imported by a wide variety of notation programs. Currently Impro-Visor does not import MusicXML. MIDI files can be exported from the File menu. Any selectable segment, or the entire leadsheet, can be exported. A menu similar to the following should open. Each tab opens to a set of things that might be played at this point. 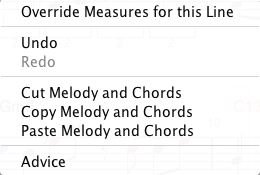 From this menu, we can select one of the suggested scales to see how its tones fit the progression. The slashes on the left indicate the directionality of the sequence (/ for up, \ down for down). Idioms are similar to cells, in that they are selected based on one chord. However, the term idiom suggests a melody that is a familiar jazz clich. Licks are melodic lines that are based on one chord or two consecutive chords. Although licks are indexed over at most two chords, they can be used over any number of chords. They just might not sound as good. The reason we index on only two chords is to keep the licks short, which permits combining them together in more ways than if we stored long licks. For licks that do not quite fit the harmony, Impro-Visor provides a rectify feature that will pull arbitrary notes in line with the chords. We can rectify the sequence by pressing shift-R with the sequence selected. The final tab in the advice menu is Quotes, which are melodies borrowed from other songs or solos. Quotes are considered a form of humor in jazz improvisation, and the musician will learn to recognize when a quote will work over particular chords based on sounds. When you run find or create a lick that you would like to save for future reference, you may save it in your vocabulary. Impro-Visor can recall saved licks as advice, and transpose them to the key of the moment. Pressing Save Lick or the u key will open the following dialog. You can give the lick a name for recall. The names do not have any formal significance for indexing, but they do show up in the advice menu. Select one of the four categories, then press either Save or Cancel. 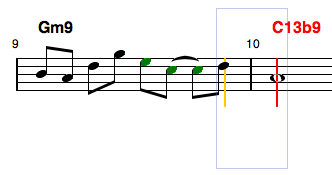 small sequences of notes, often of uniform duration, such as eighth notes. 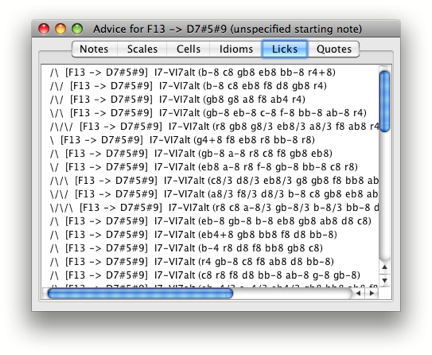 Cells are indexed in Impro-Visor by just the first chord in the selection. familiar-sounding sequences. 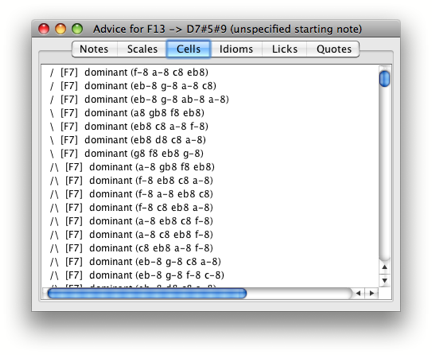 As with cells, they are also indexed by just the first chord. tend to be more complex sequences. Licks are indexed by the first two chords, or the first chord if there is only one. a melodic fragment from a known tune or solo. As with licks, they are indexed by up to two chords. I suggest naming quotes using the tune from which they are taken. 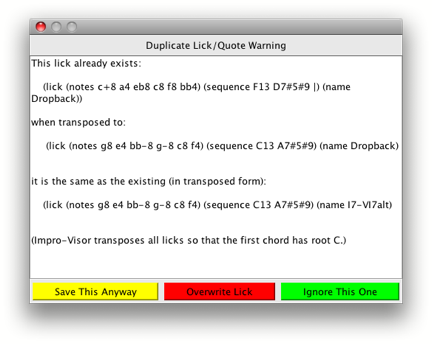 To avoid saving a duplicate lick or quote, Impro-Visor checks new licks against all licks in the database, modulo transposition. 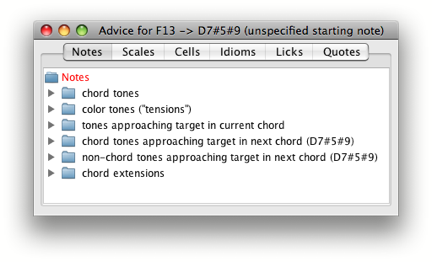 No corresponding check is made for duplicate cells, as cells generally can serve more than one chord. An alternative to using the licks from the database is to generate new licks on the fly. To generate a lick, select some number of slots. Then press the Generate button. Impro-Visor will generate a lick to fill the selected space. If only one slot is selected, it will generate from that slot to the end of the chorus. If no slot is selected, it will generate the entire chorus. Lick generation is controlled by a linguistic specification known as a grammar. The grammar governs whether the licks are complicated or simple. A grammar can also create various stylistic nuances. There is a menu of grammars located on the toolbar. 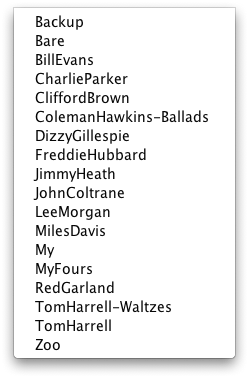 Many of the grammars are named after famous musicians. They were created from solos played by those musicians. The creation of a grammar from a corpus of one or more solos can be done automatically inside Impro-Visor. Thus the user can add new grammars. There are several separate panels. The current preference panel can also be opened with just the p key. Finally, there is also a Preferences item in the menu bar, which may be used for opening specific preferences menus. 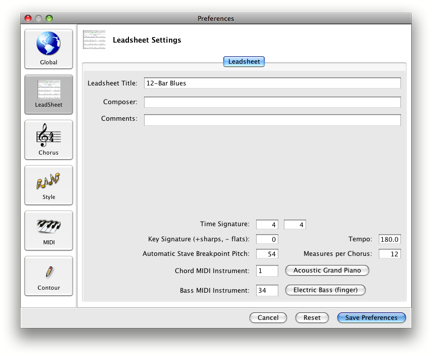 These preferences are used to control default values, such as are used when new leadsheets are opened. The Always use this boxes over-ride the setting in the leadsheet itself. For example, if you always want the leadsheet to open with bass clef, click Bass and Always use this. Similarly, you can over-ride the instrument choices that are present in the leadsheet. Currently the Layout, however, applies to all choruses, not just this one. It is a series of numbers indicating the number of measures on each line of the leadsheet. If this is blank, Impro-Visor will adjust the layout automatically. This field can be set manually, or automatically, by toggling the Freeze button on the menu bar, as was described earlier. These settings control the style, and permit the introduction of new sections of a chorus with different styles. If the leadsheet has only one style section, it may be changed by selecting a different style in the right-hand menu. If there are multiple style sections, as indicated by the left-hand menu, then each section is set independently. Adding a new section splits the current section into two equal pieces. The boundary is then adjusted by setting the Starting Measure of the second section of the split. These preferences control the MIDI interface. If external MIDI devices are used, you must select them here. 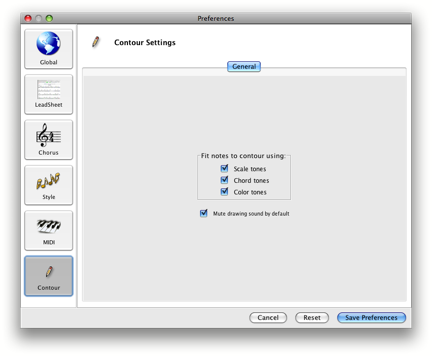 These preferences control the drawing tool interface. 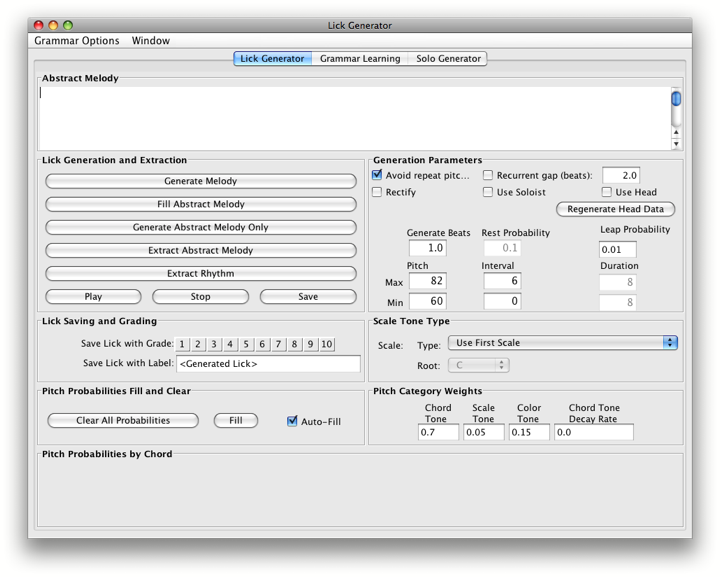 � The lick generator panel opens with lots of buttons and numbers, but you can ignore most of them for starters. 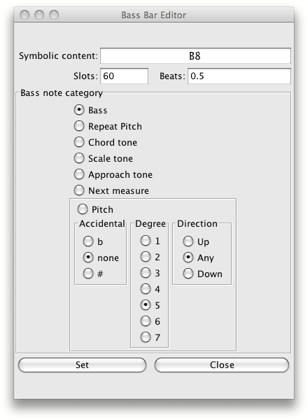 � The Generate Melody button operates the same as the Generate button in the main window. � With the control panel open, pressing Generate will fill the field called Abstract Melody. � The actual melody is derived from the abstract melody. � Once an abstract melody is present, it can be re-filled using Fill Abstract Melody, which means the rhythmic values will stay the same, but the pitches may be different. 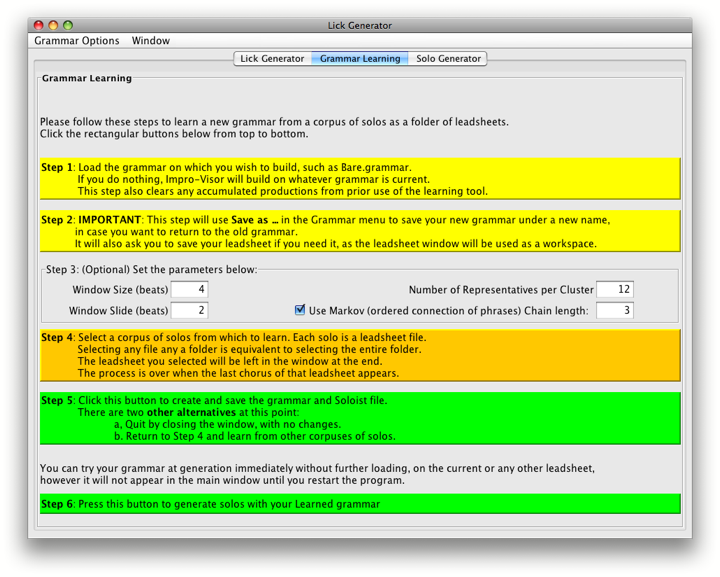 � From the File menu in the Lick Generator panel, one can open the grammar editor. � At present, grammar editing is based on editing text. � You can read about grammars in our various technical papers. � A better description is forthcoming. A second tab of the Lick Generator panel enables grammar learning. By carrying out the six steps indicated, a new grammar can be learned from a corpus of solos. This grammar can then be added to the menu of grammar choices. 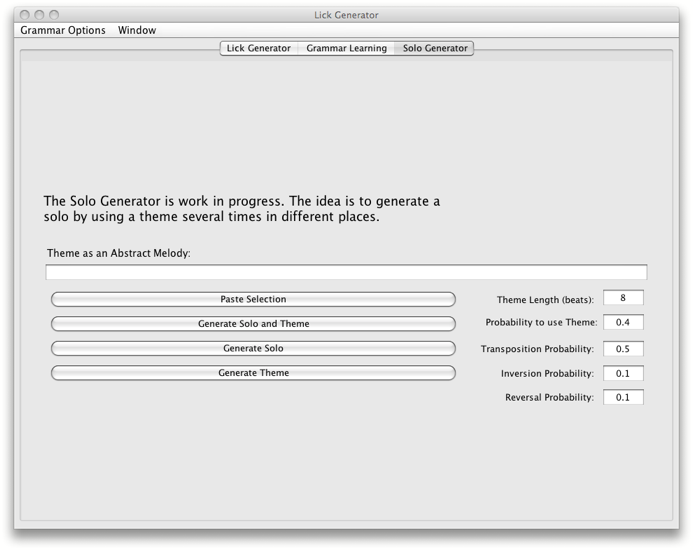 The Solo Generator tab represents some work that is not fully developed. The idea is to generate a solo that reuses a theme from time to time, based on specified probabilities of reuse. Impro-Visor provides tools for editing styles. New styles can be created using the tools. The style editor is opened through the Utilities Menu, or use key Control-Y. The style editor is organized as a spreadsheet. There are three bands: Bass, Chord, and Drums. Each numbered column corresponds to a style pattern. Caution: There is currently no undo in the style editor, so please create backups. All the drum pattern elements are considered part of a single pattern, but the bass and chord elements are separate, not linked to the others or each other. There is a special pattern language used to specify the pattern entries. 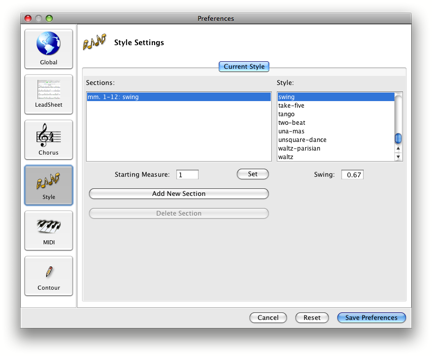 There is also a piano-roll style editor used to edit the patterns, so that it is not necessary to learn the language. 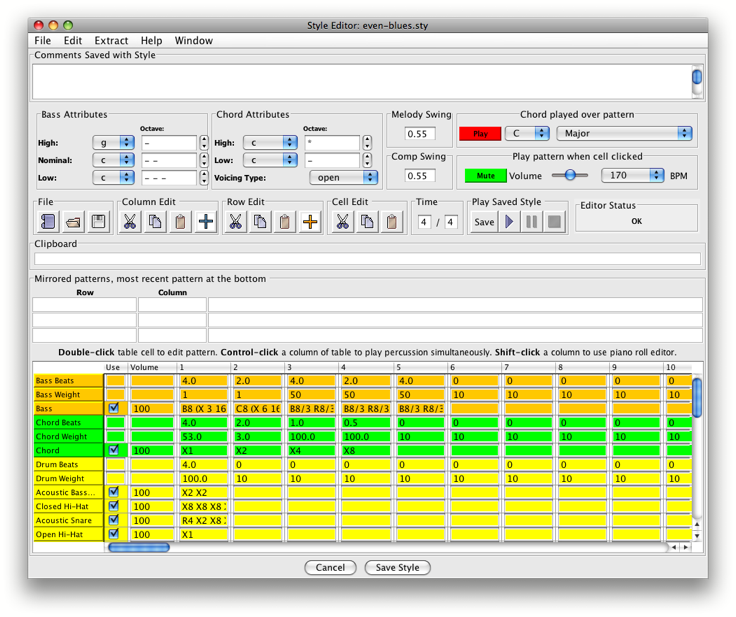 To edit a column of the pattern spreadsheet, one can use the piano roll editor. First select the column of interest, by shift-clicking somewhere in that column. The piano roll editor will open. Each horizontal bar represents the instrument being played for a specified duration of time. The selected bar is highlighted in light below. Bars can be lengthened, shorted, added, and removed, using the mouse. The various elements of the pattern can be played by pressing the buttons on the left. Drum instruments can be added in or out, while the drum parts are playing. 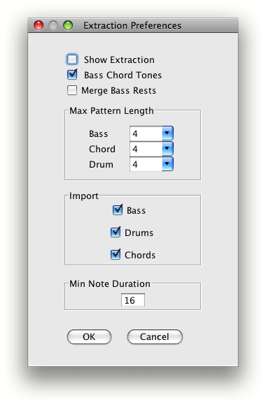 This dialog is used within the piano-roll style pattern editor to edit the pitches and directionality of the bass bars in the bass style pattern. The style extractor is used to extract an approximation of a style, given a MIDI file and a leadsheet .ls file expressing the chord progression. There is a sample MIDI file with corresponding leadsheet in the styleExtract folder that comes with the release. The purpose of the leadsheet is to interpret the notes of the bass line. There is a control panel for setting the parameters of style extraction. The Style Extractor has its own set of windows, which will be opened if the corresponding preference box is checked. These windows give details of how raw data is clustered to produce the style rules. However, it is not usually necessary to view the workings at this level to be able to extract a style. Once the style is extracted, it sometimes needs to be tweaked, e.g. using the style editor. 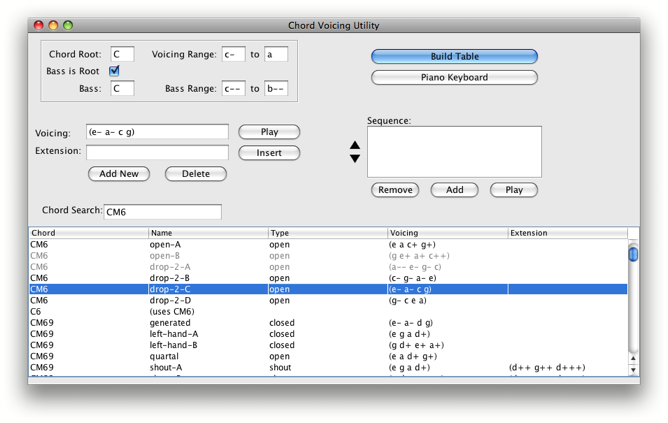 Impro-Visor uses both pre-planned and generated chord voicings in its auto-accompaniment. It will try to choose voicings that both fit in the specified range and that exhibit voice-leading from the previous voicing. It will generate a voicing using an algorithm if no appropriate voicing is found. Voicings can be edited or added using the voicing editor. Use the Utilities menu or Control-I to open. The attendant piano keyboard can be opened by itself for visualizing voicings. This concludes the current version of the tutorial. Check back from time to time, as it will undoubtedly be revised. If you have comments, suggestions, or questions, please post to the Yahoo! Group. I will be happy to take them into consideration. Suggestions for melodies that can be played over given chords. A tone not in a chord that is adjacent to a tone that is in the chord. A colloquial term for a measure of music. A small melodic fragment aligned with one chord. A somewhat standardized notation for representing chords with a few characters. One time through the chord changes of a piece. A metaphor designating a place off-screen to which content is copied. A tone not in a chord but compatible with the sound of the chord. A user interface feature for entering information, such as preferences. To set the numbers of measures per line in a leadsheet. 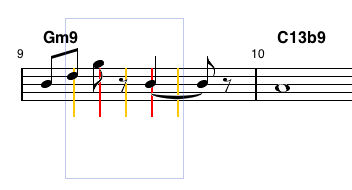 Entering notes that are aligned to the current chord, rather than chromatically. A familiar jazz melodic fragment aligned with one chord. A file type, standing for Java archive. A sheet with chord symbols and a melody line, which can be used to represent a song or a solo over the chords. A short melodic fragment aligned with one or two chords. Data that is not melody or chords directly, but which provides additional information, such as key signature, time signature, etc. A device that combines several sound tracks together in specified volumes. The change of apparent location depending on viewing angle. A note or a few notes placed before the downbeat of a melody. A chord constructed of one smaller chord stacked atop another, such as a triad over a dominant chord. Polychords are noted using the back-slash \ in Impro-Visor. See also slash chord. A melodic fragment from a familiar song or solo. To align a melody to be consistent with a chord sequence. A chord consisting of a chord and a specific bass note, which may or may note be in the original chord. In Impro-Visor, slash chords are indicated with /. See also polychord. A symbolic time at which a chord or melody note can be played. Impro-Visor currently has 120 slots per beat. A subset of the slots typically shows within the beat at a given time. A specification of how the accompaniment (chords, bass, percussion) are generated. To unset the numbers of measures per line in a leadsheet, leaving those numbers open to dynamic adjustment. 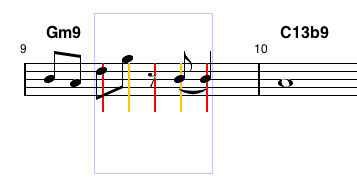 To raise or lower the pitch of all notes or chords in a selection. A file containing the specification of musical material, such as scales, chords, licks, etc. The order in which the various notes of a chord are stacked. 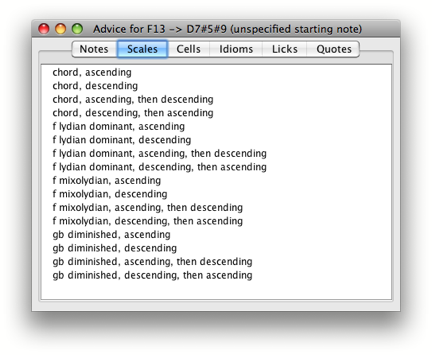 The meaning of each scale is defined in the vocabulary text file vocab/My.voc, where each scale is defined relative to a tonic C.
Note that some scales are synonyms for one another. The root pitch is placed in front of any of the following. Any may be followed by a slash for the bass note, or a backslash for a polychord for more combinations. The meaning of each symbol is defined in the vocabulary text file My.voc, where each chord is defined relative to a tonic C.
Note that some chords are synonyms for one another. I have introduced other symbols such as Maj or maj because people have asked for them. I do not prefer them myself because they take up precious space on the chord line, and also take longer to type. Also, the list of possible alternatives is pretty open-ended. I introduced h as a short-hand for half-diminished, which would ordinarily be m7b5 (minor-seven, flat five) for this reason. Here is the full list of chords in the vocabulary as I write this. On editing, be sure the parentheses balance, otherwise some aspects of your vocabulary could be ignored. It is best to use a text editor such as Emacs, which flashes matching parentheses. This is the end, for now. Thank you for using Impro-Visor.